Staff Sgt. Ty Carter receives the nation's highest military honor. 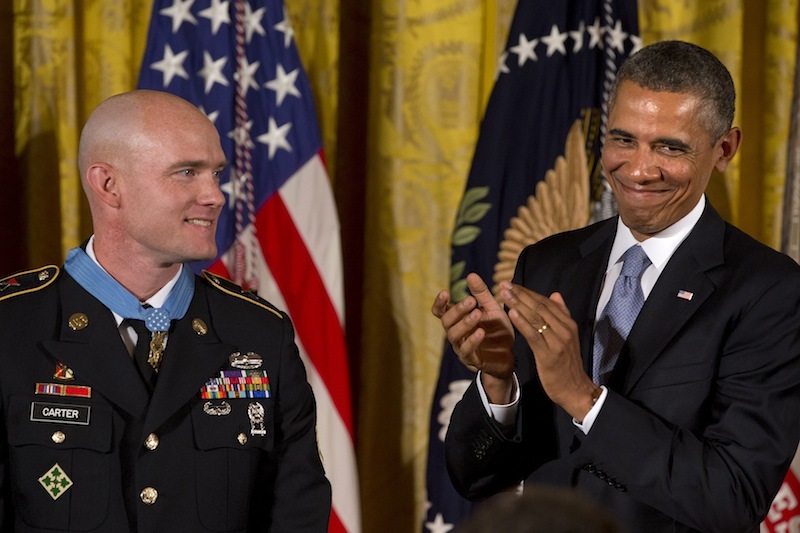 WASHINGTON — President Barack Obama bestowed the nation’s highest military honor, the Medal of Honor, on Army Staff Sgt. Ty Carter on Monday, saluting the veteran of the war in Afghanistan as “the essence of true heroism,” one still engaged in a battle against the lingering emotional fallout of war. “As these soldiers and families will tell you, they’re a family forged in battle, and loss, and love,” Obama said as Carter stood at his side and members of his unit watched in the White House East Room. 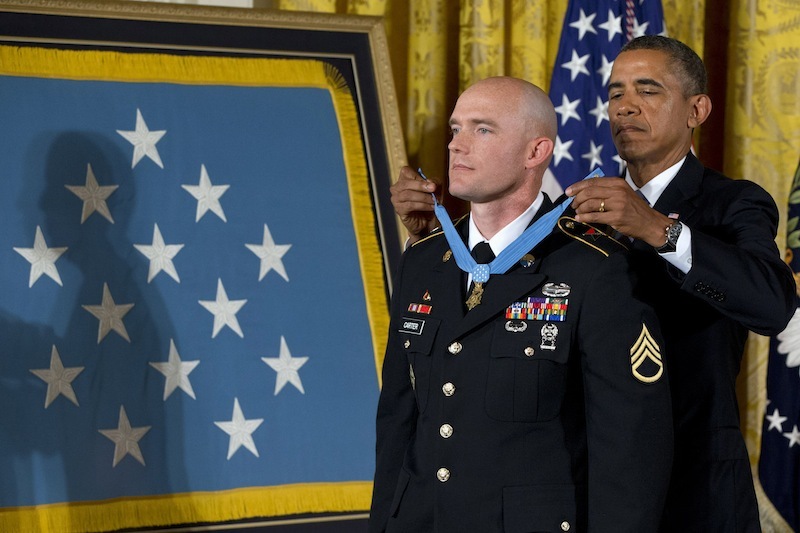 Then as an Army specialist, Carter sprinted from his barracks into a ferocious firefight, a day-long battle on Oct. 3, 2009, that killed eight of his fellow soldiers as they tried to defend their outpost — at the bottom of a valley and surrounded by high mountains — from the onslaught of a much larger force of Taliban and local fighters. Still suffering from post-traumatic stress syndrome, Carter stood nearly emotionless during the ceremony, although a faint smile crossed his face near the end that turned into a broad grin as Obama hung the metal and its blue ribbon around his neck and the audience — which included 40 members of the recipient’s family — answered with a rousing standing ovation. He also said he wanted to help the American public to better understand the “invisible wounds” still inflicting him and thousands of others. 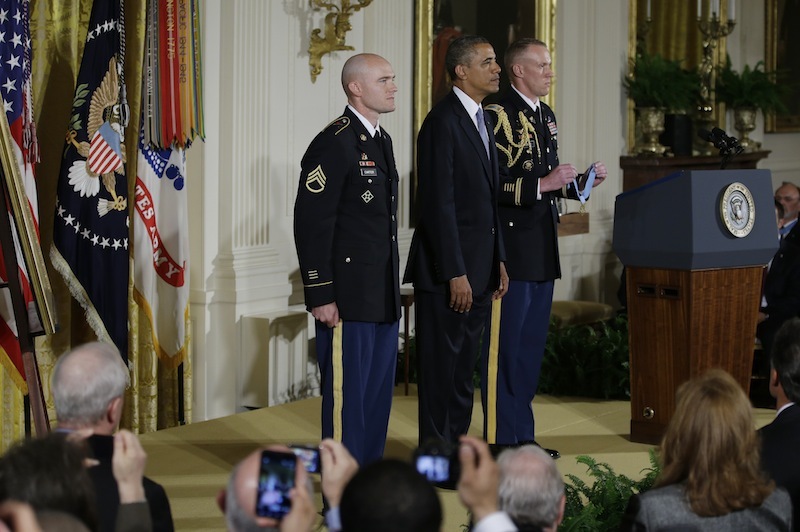 Obama praised Carter for talking openly about the disorder for some time. Obama said that Carter, like many veterans, “at first resisted seeking help,” but later accepted counseling. “The pain of that day … may never go away,” Obama said, including flash-backs and nightmares. But he praised Carter for seeking help and pushing back, and for acknowledging his struggle publicly and helping other troops with their recovery.